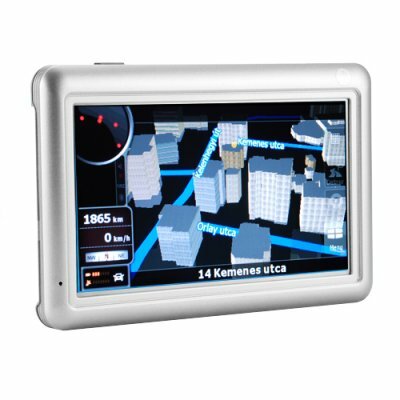 Successfully Added 5 Inch Touch Screen GPS Navigator With Bluetooth to your Shopping Cart. 5 inch touch screen GPS navigator with Bluetooth that will help you more easily get where you are going and also enables you to make and receive calls while in GPS mode. This GPS unit will make your driving experience more comfortable and stress free. Finally we have a simple stress free solution for all drivers. This GPS navigator with Bluetooth and media functions is the perfect companion for any car owner or driver. What makes this GPS navigator special is its portability which makes it easy to take out of the car when not in use. This handheld portable GPS navigation system can be used anywhere and fits nicely in your carry-on bag. This unit comes with a earphone jack, AV IN, USB connection and SD card slot that are all located on the side of the unit for easy reach, along with a built in MIC located in the front of the GPS navigator to make your conversations clear. In addition, the GPS unit performs exceptionally well, with instant response time to user input commands when typing your desired location on its beautiful 5 inch touch screen. You can type with speed and comfort, along with advanced touch screen technology, which lets you touch and drag, making it ever so easier to find locations on a map, this is definitely one of the best high performance and user friendly handheld portable GPS navigation unit you can own. This is truly a high end performance GPS navigator that has one of the simplest menu navigation system with an amazing touchscreen interface. This GPS system is also media rich with many PMP features (portable media player) to keep you occupied while you are on any long journey. The CVSB-CS11 has been carefully designed to enrich the users driving and entertainment needs. This portable GPS navigator make a great product for single/company use, resale market, online or physical store, and is available to you straight from the leader in direct wholesale electronic, Chinavasion. Very simple menu system, slide of finger to select menu. 5 inch touch screen makes navigation and viewing easy for the driver. This GPS unit includes an SD card with simple evaluation GPS maps - you will need to purchase GPS map software for this product to function properly as a navigator. After an extensive review of all the available global GPS map providers we have found that the best GPS maps for each region of the world, including Europe, South America, Arabia/Middle East and North America, are usually found in the users own country. Therefore we encourage you to download or buy GPS map software from a supplier in your home region. Does this unit support Greek language? If your GPS software support Greek, then the display and voice language will be in Greek. Most map software comes with a wide selection of language choices, which means both the display and sound (voice) will be in your preferred language. However, you should carefully select and buy the map software that is best suited for your region of the world. Does this unit come with an antenna? No, the antenna is built in, so all you need to do is insert your GPS SD card that works best for your region and start using it straight out of the box. Does this unit come supplied with an SD card? Yes, the GPS Navigator comes supplied with a 2GB SD card. Thank you for produtk,kachestvo excellent, delivery in terms!!!! All to Your command!!!!!! and DHL for good and fast shipping,see you next time. perfect!!! i tried it for 4 days in ROME! IGO is a winderful 3D software... i tried also to setup TOMTOM, but ... impossible to setup any kind of maps!!! anyway, fast to switch on/off and to take the satellites! on 2009-05-10 00:59:18 Very good item!!! Very good GPS!!! Thank you Chinavasion!!! it's really great.just arrive today.thank you chinavasion! !